Our local Fareway grocery store had ordered some pork belly for a customer, and had some left over, so I decided to try smoking some. 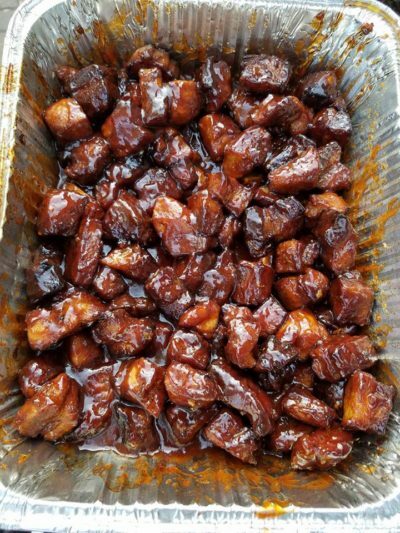 My original plan was to make bacon, but I got up one day and the weather was perfect to sit outside smoking meat, and I hadn’t cured my pork belly (which takes 7-10 days) so I decided on Pork Belly Burnt Ends. I started with 1/2 of a pork belly (about 7lbs) with the skin removed. There’s a lot of fat on pork belly, and you want to leave a fair amount, but trim away some excess. I probably had over a pound of fat that I removed. cut the meat into 1 1/2 to 2 inch cubes. apply Extra Virgin Olive Oil (enough to coat the meat) and your favorite dry rub (if you don’t have a favorite I recommend making up some Raichlen’s Rub #2) – Be generous (use about 1 cup of dry rub for 5 lbs of meat). Smoke for three hours at 225-250 degrees or until you like the color of the meat. A nice bark will form starting around the three hour mark. Then cover and braise in smoker for another 60 – 90 minutes. You will find that the liquid braises at or near a boil and that the fat renders down in the burnt ends keeping the pan moist. Again, you have added additional fat in the butter, the honey as a binder and the sauce for flavor to really render out the fat that is in the pork belly. I smoked these for 3.5 hours at 325° using Apple wood in my Masterbuilt electric smoker. I then followed that up on the Weber Kettle charcoal grill using Kingsford charcoal with some apple wood chips thrown on top over indirect heat for 30-40 minutes to get a better bark on them. I then sauced them up and braised them on the Weber gas grill (mainly because I could control the temperature better than on the charcoal grill) for 45 minutes at 250° before removing the cover to tack them up.